The only good thing about off season for most football supporters is the new signings that arrive at the club and the launch of the clubs newest kits. This morning it was Arsenal’s turn to reveal their new away kit. The new kit is a purple hooped design that gives the kit a regal flavour in this Diamond Jubilee year for a side that was known as ‘Royal Arsenal’ in the 1890s, having been formed at the Arsenal munitions factory in Woolwich, South London. Its also part of the Nike brand of making new shirts lighter each year and enviromentally friendly by using recycled bottles to make the kits. As a gooner what are my thoughts on the kit? Well its different and I like different. 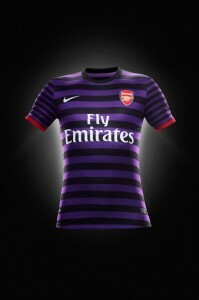 Hopefully the colour doesnt lead to more frustration on the pitch for the Gunners this year! DHL Man Utd Tour, its here!